The equipment needs of the medical industry are incredibly important to our team here at Dynamic Design & Manufacturing. Our medical clients' needs for specific equipment and precision metal parts are accomplished due to our highly trained team and precise sheet metal fabrication tools at Dyco. As a top manufacturer of precision medical parts, we provide a variety of machining and metal fabrication services to the medical industry including laser cutting, metal punching, CNC machining, press brake forming and more. We have decades of experience manufacturing precision metal parts in stainless steel, aluminum, and more for the medical industry. At Dynamic Design and Manufacturing, we have built a reputation for being able to deliver high-quality precision metal products on-time. Our team excels in providing our customers with unparalleled value-added technical expertise and support. Lastly, our knowledgeable team has been trained to understand the importance of the machining needs of the medical industry, which ultimately makes Dyco the best option for all your medical fabrication and manufacturing needs. As a trusted partner to the medical industry, Dynamic Design & Manufacturing delivers custom precision sheet metal fabrication products for many types of medical devices. Our engineering and production staff meets with clients early in the product development and design phase to ensure manufacturability of the desired parts. From there, our team guides clients through the manufacturing process and works tirelessly to deliver the highest quality precision machined parts to meet or exceed our customers' expectations. 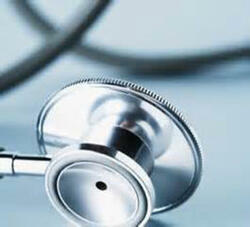 When considering the requirements of the medical industry, we only accept the highest quality of work. Dynamic Design and Manufacturing is ITAR compliant and our manufacturing processes are ISO 9001:2015 certified which makes Dyco fully compatible with medical industry expectations.